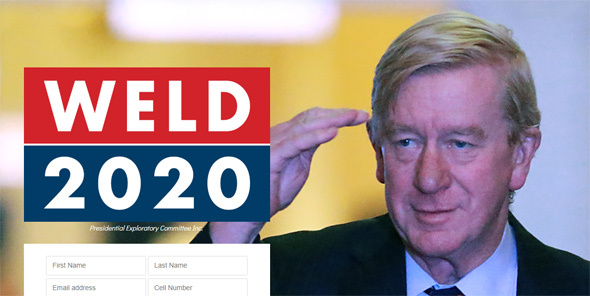 Is Bill Weld running for president or trying to convince O'Reilly to let him write a book? He's got a campaign video that plays up his appointment by St. Ronnie, but doesn't mention the courage it took to resign from the Reagan Justice Department, and which points to his huge margin in his first election, but forgets to add he ran against a man who self-immolated in an angry interview with a beloved local anchorwoman. Yes, of course he has a Web site. WBUR reports the former river-diving governor has formed an exploratory committee to look at running for president in 2020 - as a Republican. Looks like Big Red Weld wants to primary Donald Trump. And it's possible Seth Moulton is getting over his shellacking in the house-speaker skirmish and might be gearing up as well on the Democratic side. Gretchen Van Ness, who came in second to incumbent state Rep. Angelo Scaccia in a field of five in the Democratic primary for the 14th Suffolk state representative district (Hyde Park, Roslindale, West Roxbury) told supporters today she will run again in 2020 but that for now, she will concentrate her free time on working to support Question 3, which would enshrine transgender people's right against discrimination in public places. Read more. A concerned citizen filed a 311 complaint today about this graffiti on Oliva Road in Brighton. Marked it as "offensive" as well.